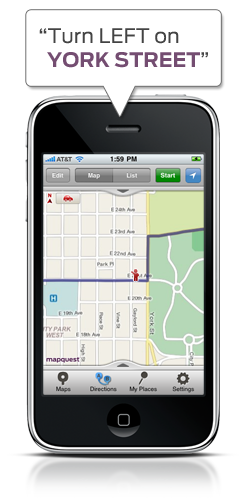 Mapquest has updated their iPhone app to support iOS 4 with fast switching, and more importantly is now able to run in the background therefore offering iPhone users with another free turn-by-turn navigation choice. In fact, Mapquest may be the most high profile mapping service running free turn-by-turn on the iPhone, as Google Maps is probably not coming to the iPhone any time soon and all the other more well know GPS navigation systems aren’t free (and some will run you $50). However, Mapquest isn’t alone as the only free option with both Waze and Skobbler offering free apps as well. The updated Mapquest app provides spoken street names “in a friendly voice” that tells you to “turn right on Garden Street” for example. The app also auto re-routes you when you miss a turn – both are pretty standard for turn-by-turn navigation (both Skobbler and Waze do as well). There is no denying though that Mapquest is the most recognized brand here. If Google Maps takes a long time to come to the iPhone (or never comes), then Mapquest could do quite well with this app towards regaining some market share back from Google Maps in mobile – remember, this app is a map app, and turn-by-turn is an added bonus. Of course, plain-old Google Maps comes on every iOS 4 and can’t be deleted, so Mapquest is going to have a hard time becoming the defacto mapping app on iOS 4 even with this very important improvement unless something changes in the Apple/Google relationship and Google Maps no longer becomes pre-installed. Also, there have been rumors that Apple itself is building a mapping product, which might make all of this moot somewhere down the line.